I really like cute food. I eat with my eyes first, so if it’s cute, I’ll provide it with a barrage of awww’s while devouring it. This is one of those recipes you could totally make your own — that’s the whole idea, right? Due to the fact it’s been a deliciously fatty holiday (as it should be), I had some frozen puff pastry leftover and decided to throw some delicious eggy goodness in there and bake it pretty. If you don’t like mushrooms, you’re a weirdo — kidding! You can totally leave them out. 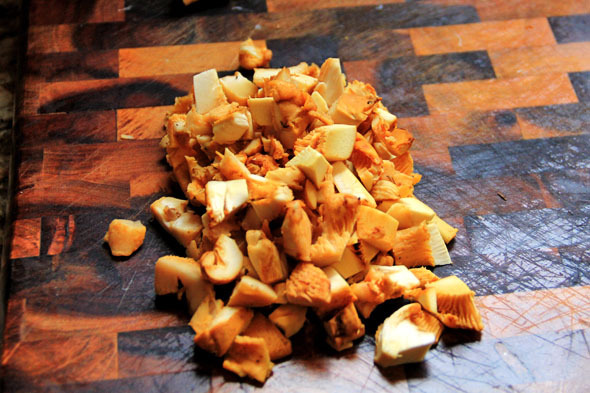 You could swap out the expensive chanterelle’s for a more affordable button, shiitake, or portobello variety. You could use bacon instead of sausage, ANY kind of cheese you want — the possibilities are endless. 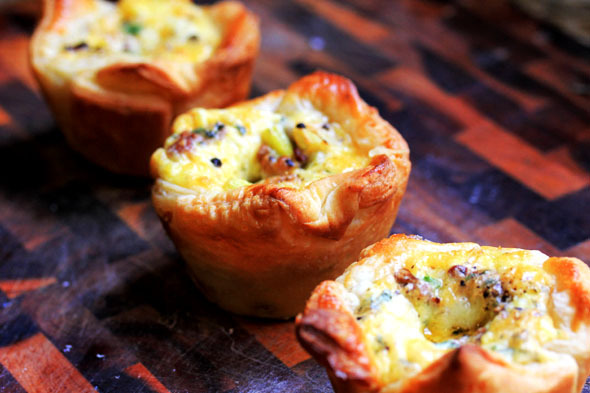 These are little buttery pockets of breakfast perfection. Eggs go with everything, but they pair especially well with a smokey sausage, wild mushrooms, sweet leeks and tangy, creamy cheese. 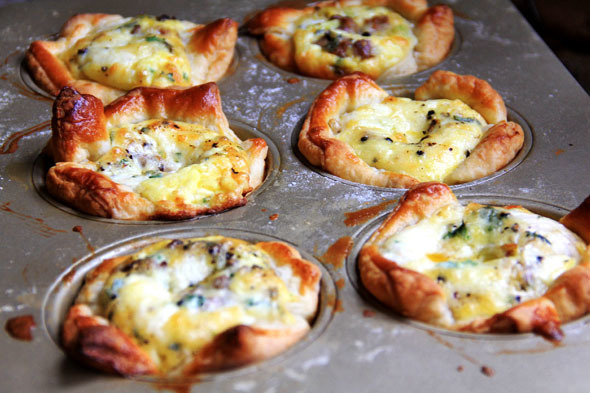 When these start to bake, the egg mixture puffs up and lets you know it’s just about done. You can control how “done” you want these. I have found that my oven on 400 degrees makes the perfect mini-frittata in exactly 15 minutes. The eggs were creamy and cooked to perfection, they weren’t rubbery or dry at all. 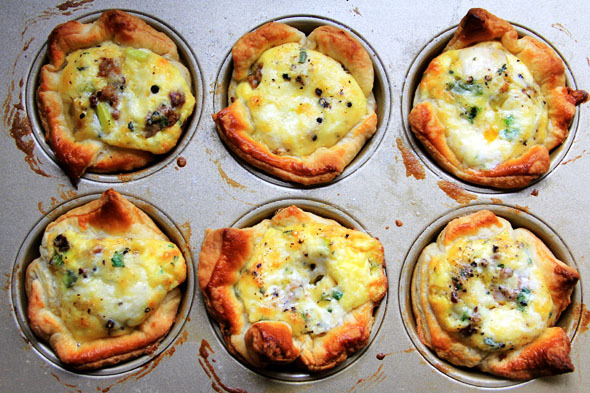 Moist goodness, almost quiche-like. 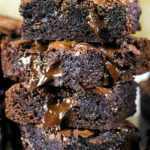 My friend just sat there cussing and shaking his head, “Damn, these are so good! I gotta have another one”. Meanwhile, I could only scarf down one lol — his stomach is a lot more forgiving than mine. They were the perfect portion size and filled me up quite nicely. Work as fast as you can, because puff pastry is filled with butter and your hot little fingers might melt the dough if you over-handle it. Keep your work surface, hands, and rolling pin (if using) lightly floured to prevent the dough from sticking. If you experience any tears, dab your fingers in water and “glue” the dough back together. Quickly put it back in the fridge for a few minutes to secure your patch-job. If your dough gets too warm and sticky, immediately throw it back in the fridge or freezer to get cold again — just for a few minutes. Don’t let the dough get too warm — I cannot stress this enough. Keep the dough as cold as you can, or it won’t rise very well once it’s baked. Yes, you can re-roll scraps. Thaw your puff pastry dough at room temperature until pliable (about a half hour, depending on the temperature in your kitchen). 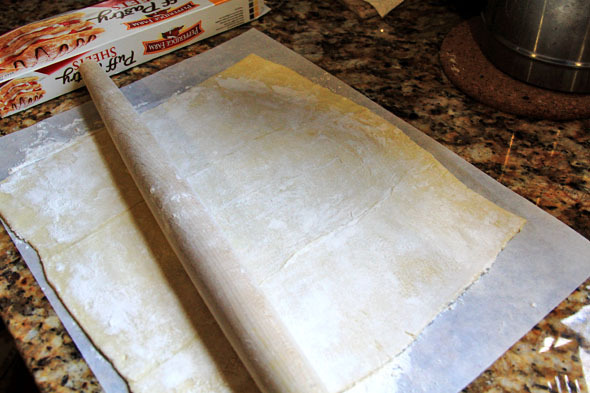 Flour your work surface, hands, and rolling pin and roll pastry out to a larger rectangle, making sure to connect the seams so it’s all one piece. With a very sharp knife or pizza cutter, cut the sheet of dough into 6 squares (if using a jumbo muffin tin, cut into 12 squares if using a regular size muffin tin). Roll each square so that it’s large enough to fit into your muffin tins. GENTLY fit each sheet of dough into the tin, careful not to rip it. Just make sure it’s sitting at the bottom and pressed against the edges. Now that they’re all snug as a bug, throw your pan into the fridge or freezer to keep cold while you cook everything else. To prep your leeks, cut off the base and the dark green head. We only want to eat the light green and white parts. Score the outermost layer of the leek and peel off, it’s usually bruised and beat to hell. We don’t need it. 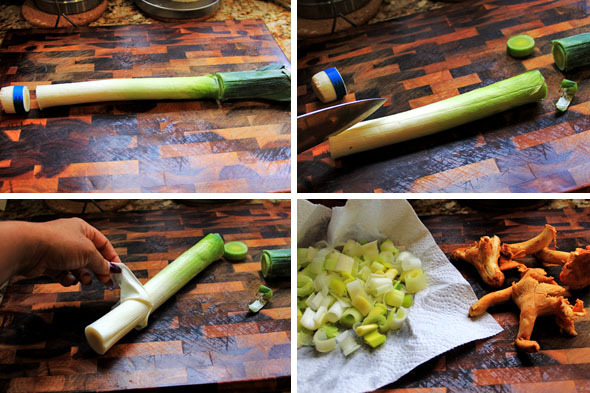 Cut the leek in half, lengthwise then cut into thin strips. Wash thoroughly! Leeks have lots of natural sand lodged in between their layers. Rinse under cold water thoroughly, separating the leeks with your fingers. Alternately, you could soak the leeks into a bowl of cold water and let the sand/dirt fall to the bottom. Rinse and pat dry. With a damp paper towel or kitchen cloth, gently wipe away the dirt from each mushroom. Cut off the woody ends and chop into bite-sized pieces. Cook the sausage and crushed red pepper in chunks, then break those chunks down a little more as they cook. Don’t overcook the sausage, it will continue to cook in the oven. Just cook until there is no pink and minimal caramelization. Remove with slotted spoon, then add the leeks and seasoning. Cook down for about 4 to 5 minutes, just until they’re soft. Remove with slotted spoon, then add the mushrooms. Let the cook for about 4 to 5 minutes. Mix the leeks, sausage and mushrooms together evenly in a bowl and let the mixture cool down for a few minutes. You don’t want it too warm because it’s going directly in the cold puff pastry. Meanwhile, whisk 7 large eggs in a bowl. Add the cream, salt, pepper, butter and mix thoroughly. Add the cheese last and gently fold that in. Don’t overbeat your eggs, it’ll overwork the proteins and make them rubbery. 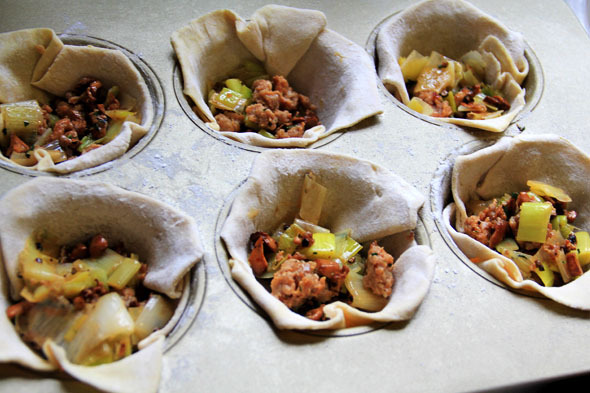 Once the meat mixture has cooled, take your puffy pastry out of the fridge or freezer. Fill each cup evenly with the mixture. 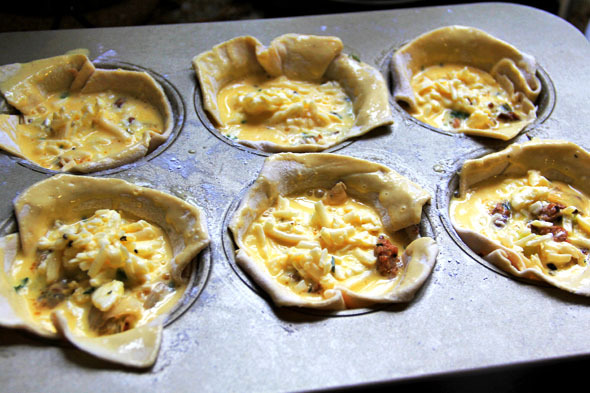 Pour the egg and cheese mixture evenly inside each tin, careful not to let too much of it leak down the sides of the pastry. 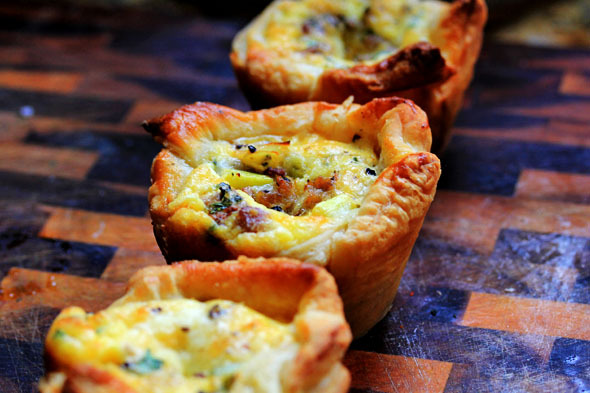 Brush the edges of the pastry with the egg mixture inside, just to get a nice shine. About 15 minutes later, we have beauty. Aren’t they gorgeous? They’re not just looks, either. They taste so good. 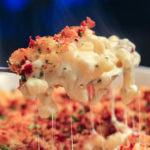 You guys will enjoy this recipe. Very easy and fun to make. The eggs are perfectly set, tender and buttery. Let them cool abut 10 minutes before removing them from the pan. They should remove pretty easily, but run a small paring knife along the sides to loosen just in case they stick. Serve this with a simple salad with a citrus vinaigrette, and thick tomato slices sprinkled with sea salt and black pepper. Pre-heat your oven to 400 degrees, middle rack in place. Thaw puff pastry according to manufacturer’s directions. Flour surface and roll into larger rectangle. 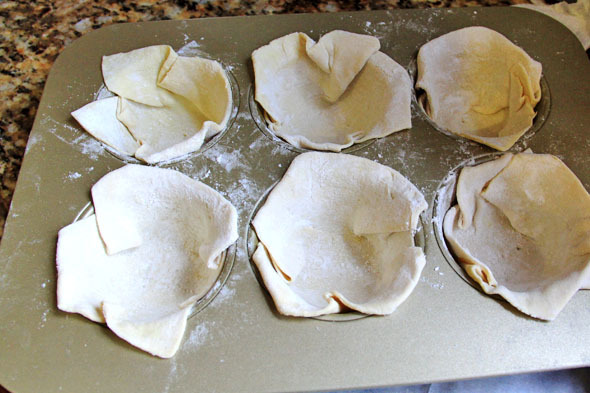 Depending on if you’re using a jumbo-muffin tin or regular muffin tin, cut dough into 6 or 12 squares. 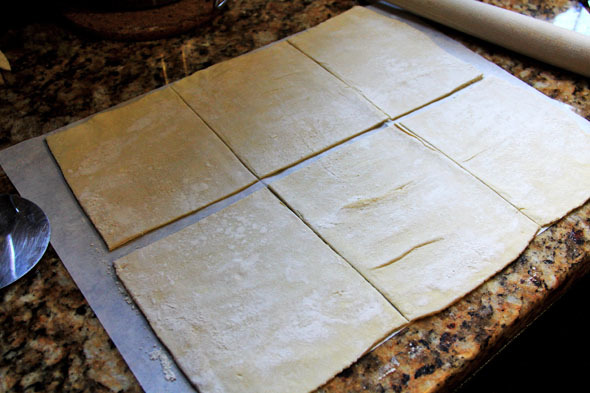 Roll each square out large enough to fit inside each tin, with enough dough to hang along the sides. Work quickly, as puffy pastry can melt if your hands or environment is too warm. Pop it back in the fridge to keep it cold if you need to. Spray each muffin tin with non-stick cooking spray, then wipe most of it out with a paper towel. There is enough butter in puffy pastry to keep it from sticking, BUT we’d rather be safe than sorry. So wipe most of the non-stick spray off, keeping a very thin film of it in each tin. GENTLY press each square into a tin, making sure it’s sitting at the bottom and along the sides. Be careful not to tear it. if you tear it, “glue” it back together with a wet finger and immediately pop it back in the fridge to harden. Continue until each square is in the tin, then place in the freezer while you cook everything else. Heat one tablespoon of olive oil in a medium skillet over medium-high heat. 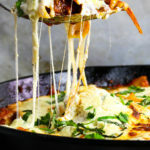 Add the sausage, and break into bite-sized chunks with a wooden spoon. 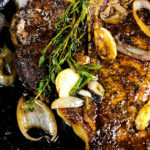 Add the red pepper flake, balsamic vinegar, and cook until meat is no longer pink and balsamic vinegar is soaked into the sausage, about 4-6 minutes. Add the garlic, if using, and cook for just 30 seconds. 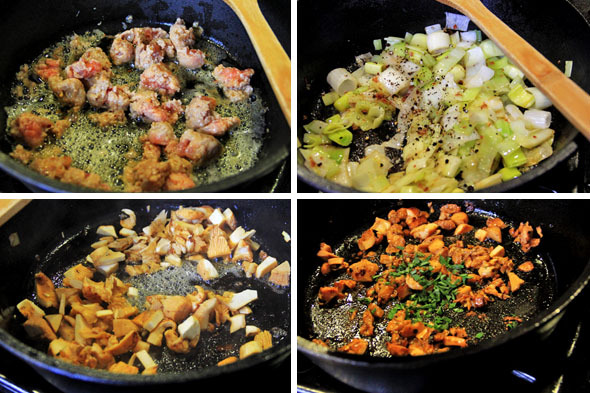 Remove the sausage and garlic with a slotted spoon into a separate bowl, leaving behind the oil and rendered fat. Reduce heat to medium, add the leeks in an even layer and cook for 1 minute without stirring. Using the wooden spoon, stir the leeks around to pick up any browned bits stuck on the bottom of the pan from the sausage. Add salt and pepper and cook the leeks down until they’re soft and translucent, about 4 to 5 minutes. 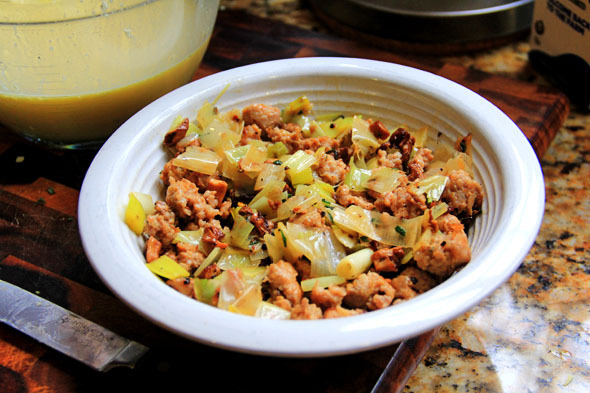 Remove leeks with a slotted spoon into the bowl with the sausage. If needed, add 1 more tablespoon of olive oil to the hot pan, and add the mushrooms without stirring for 1 minute. Stir the mushrooms around to help them cook down just a bit and develop some great color, about 3-5 minutes. 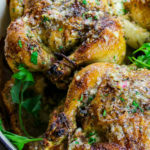 Add the fresh herbs and cook for just 30 seconds to let their flavors bloom. Remove the mushrooms and herbs with a slotted spoon into the same bowl with the sausage and leeks. Gently mix mixture together so it’s evenly combined, then let cool in the fridge for about 10-15 minutes. 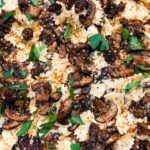 In a medium-sized bowl, whisk together the eggs, cream (or milk or half & half), pinch of sea salt and black pepper, parsley, and frozen diced butter until evenly combined. Do not over-mix the eggs or they’ll come out rubbery. Finally, add the cheese and gently fold with the whisk. Set aside. 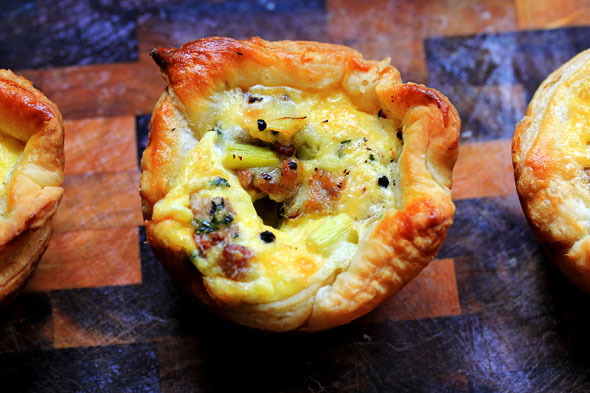 Once the leek, sausage and mushroom mixture is cool, take the prepared puff pastry out of the freezer. 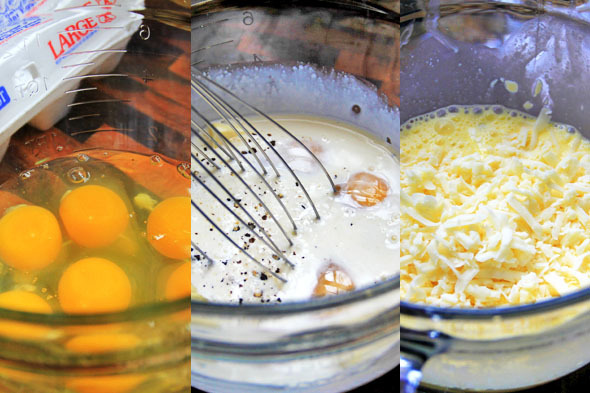 Evenly fill each cup with the mushroom mixture, then evenly pour in the egg & cheese mixture. 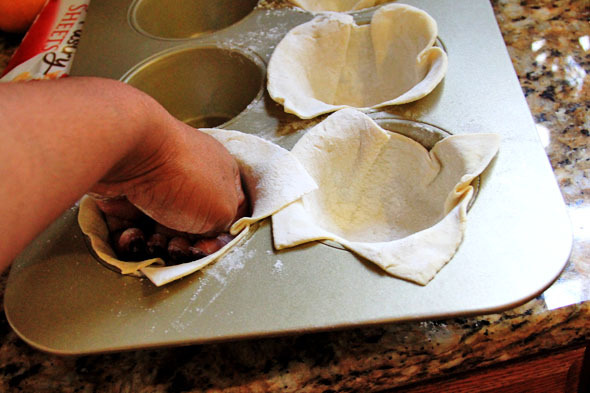 Using a pastry brush, paint the edges of each pastry with a little of the egg mixture inside of each pastry. 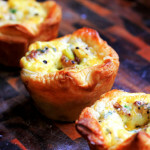 Immediately place inside of your hot oven and bake for 10-15 minutes, depending on the size of your muffin tin. 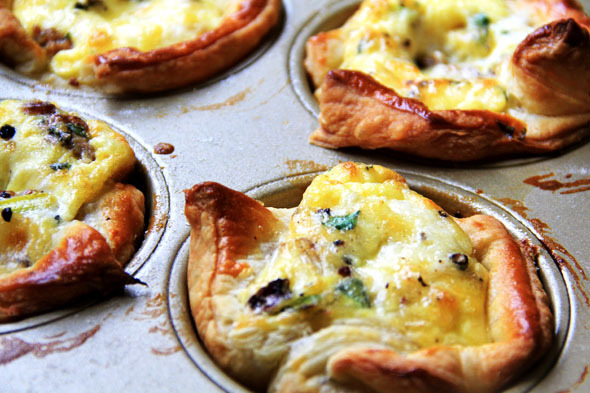 Keep in mind, I used a jumbo-muffin tin and mine were done in exactly 15 minutes. If you’re using smaller muffin tins, your baking time will probably be reduced by a few minutes. Keep an eye on it. 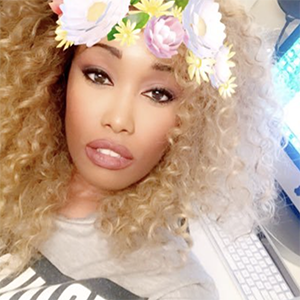 Edges should be golden brown and eggs should be set with a very slight jiggle. Use your best judgement. When done, remove from oven and let cool inside the tins for 10 minutes before removing. Use a paring knife to help loosen the sides if necessary, gently use your fingers to turn each pastry to ensure it’s not sticking, then pop them out and eat them. Enjoy! 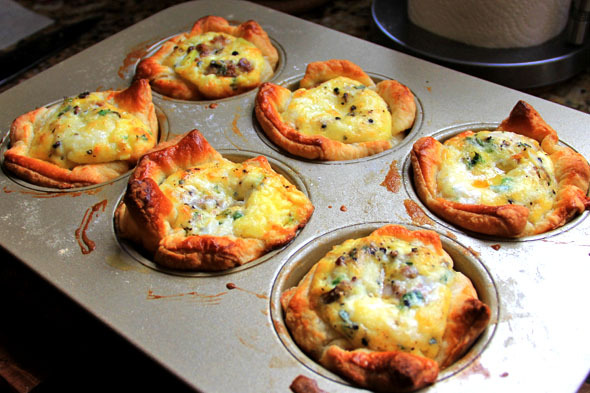 Use ANY cheese, mushroom, or sausage you want/have on hand. The whole idea of a frittata is to use what you have available, don’t feel obligated to use every ingredient here. Make this yours.